It’s taken a few weeks to sort through quite literally thousands of photos but I’ve finally finished a fairly major update to my portfolios! You can see my Performance photos here and this is my Portraits portfolio. It’s never easy trying to put a portfolio together. It sounds like it should be simple – pick out a few of your best photos, put them online, job done! But sit down to do it and you find yourself caught between wanting to show off every single image you’ve ever taken and, at the same time, plagued by a nagging feeling that none of your photos are really as good as you’d like them to be. In the end though you have to just get on with it! I think the most important thing to keep in mind is focus. The questions to constantly remember are – ‘who is the portfolio for?’, ‘what do they want to see?’ and ‘what do I want to show them?’. As a working photographer my audience needs to be people looking for a photographer – potential clients – and I need to show them the kind of work I want to do! With my performance portfolio I think I’m getting there. I’ve a good range of work and, while it’s pretty obvious that most of what I’ve done to date has been youth theatre orientated, I’ve taken images of productions with casts of as few as one up to several hundred strong in all kinds of theatres and locations. So I’d hope it shows I can take on pretty much anything that’s thrown at me and produce good images. My portrait portfolio however isn’t really quite where I want it to be. I think it shows my style – I like clean, simple images and for my subjects to have fun and really enjoy being photographed – and I think a lot say something about what their subjects are like as people. But I want more photos that tell a story about the people in them. Stories about who are they, what they do and where they do it – photos that give you a real feel for them. What I have right now is very studio heavy and I’d like to have more photos of people in their own environments. So I think it’s time to get out there and start taking some photos to fill that gap. I need to get organised and make time for some personal projects producing images that are what I want to be paid for. I’ve a few ideas I’m working on so watch this space! 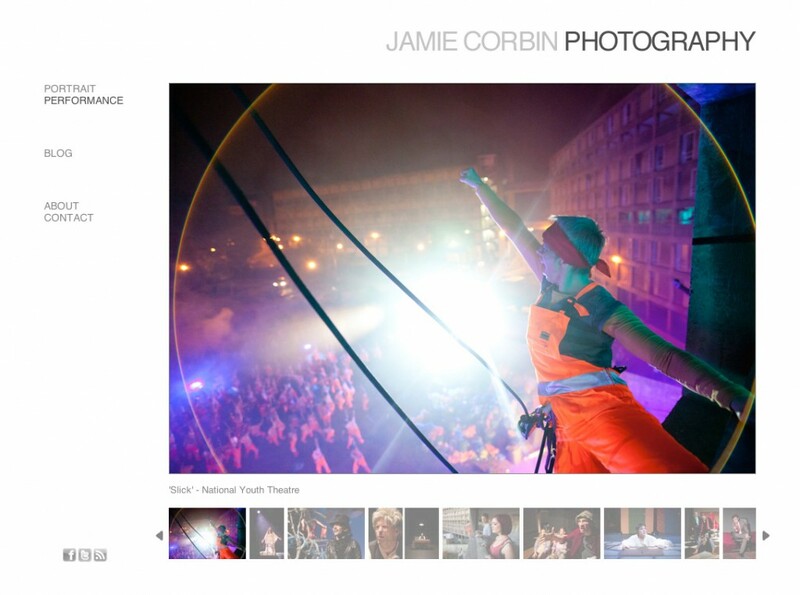 This entry was posted in Website and tagged Portfolio, Update, Website on April 27, 2013 by Jamie Corbin. It’s taken me a while but I’m finally starting a blog for my photography. Here I’ll be posting recent work, stuff from behind the scenes, things that have inspired me and some of my own thoughts. I tend to ramble wildly though – so I’ll try and keep the latter to a minimum! This entry was posted in Website on April 25, 2013 by Jamie Corbin.